There’s rioting in London… a school lockdown in Florida… a mysterious UFO trail in the skies over California… alarm over the unexploded bomb from Yemen that was set to detonate somewhere along the Eastern Seaboard. Ex-President Bush is taking heat for personally authorizing (and defiantly defending) the serial waterboarding of alpha-terrorist Khalid Sheikh Muhammad. And of course, beloved cop-killer Mumia Abu-Jamal is still on death row (29 years and counting). But the most compelling news story of the moment has to be the banning of McDonald’s Happy Meals in San Francisco. Yes, America’s most leftward metropolis is cracking down on the fabled fast-food empire in an attempt to turn back the rising tide of childhood obesity. For those of you without prior exposure to Happy Meals, let me try to summarize their contents and their unique appeal to the juvenile demographic. 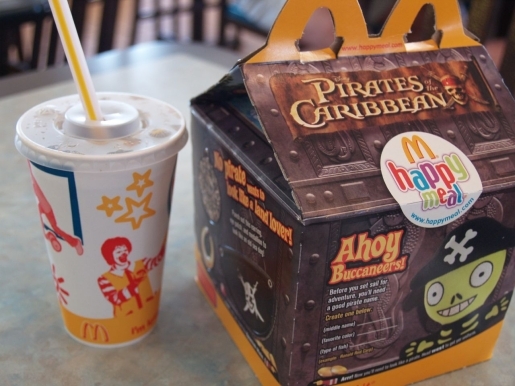 You choose the main course (hamburger, cheeseburger or Chicken McNuggets), the side order (French fries or apple slices) and the beverage (milk or apple juice) — all of which come packaged in a big, colorful box equipped with a plastic toy that conveniently promotes the blockbuster kids’ movie du jour. Granted, the meal isn’t especially nourishing, and the movie tie-ins are the essence of crass commercialism. But Happy Meals live up to their name: they delight the little ones. Especially the toys. Just ask my 6-year-old son. I’m sure the kids will love the vegetable requirement. Every youngster’s heart leaps at the thought of consuming arugula salad or wilted greens alongside a kid-size portion of seared ahi tuna with wasabi-leek sauce. But hey, San Francisco is San Francisco. The serious issue here (and yes, it is serious despite my imperfectly suppressed mirth) is whether government has the right — or even sufficient wisdom — to legislate our diets. Several major religions have successfully imposed dietary regulations throughout history, but it alarms me when a city council starts deciding what kind of food its residents shouldn’t be allowed to eat. San Francisco’s motives are understandable, even admirable: I’ve often wished for more salubrious offerings at the fast-food chains. But it’s not as if we’re forcing Happy Meals on our kids every day. My son and I venture out to the golden arches about twice a month at most. Even if parents are dumb enough to fatten their offspring with McDonald’s cheeseburgers on a daily basis, is it really the government’s business to tell them they can’t? Is the government overstepping its bounds when it restricts the product offerings of American companies? Here’s The New Moderate’s eminently reasonable solution: fast-food chains should be free to clog our arteries with all manner of fried, salted, fatty and sugary foods… but they’d also be wise enough to provide nutritious, low-calorie alternatives to the usual fare. In other words, they’d give us a choice. The San Francisco decision eliminates choice; it meddles with the rights of private companies and the desires of private individuals. Conservatives and libertarians would decry the McDonald’s clampdown as a socialist scheme to control the masses, or even as a kind of dietary fascism. As a moderate, I see it as an expression of elitist Left Coast disdain for popular tastes. You know: McDonald’s… kids… fat kids… publicly educated fat kids… ugh! The kids just want their Happy Meals. I say let them have those Happy Meals — as an occasional treat, a cheap family outing, a chance to open a crass but entertaining new toy. ← Keith Olbermann: He’s Baaaack! Priscilla: I love it! I’ll have to read this guy. greyfoot: Yes, there’s an obvious moderate alternative to fattening food vs. puritanical government-imposed dietary restrictions… We see it; why can’t the rest of the world? The liberal assumption is that we commoners can’t be trusted to make the right choices for ourselves. They’re not entirely off base, but the point is that we all have a right to make wrong choices. The only area that might call for government intervention is where those choices affect the well-being of others. Exposure to second-hand smoke is one example, though I’m sure the perils of inhaling second-hand smoke during a one-hour visit to a bar are greatly exaggerated.